Candied pomelo rind. 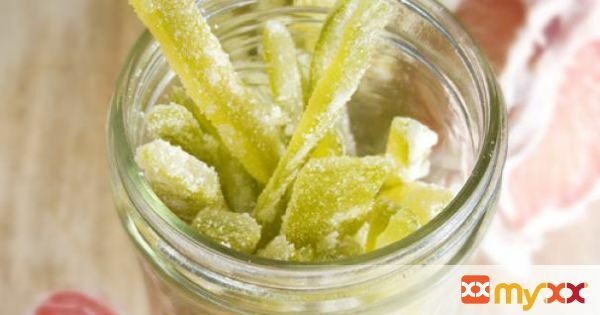 A unique and easy citrus candy for the holidays. 1. Use a paring knife to make four slices along the top of the pomelo rind to the bottom. Peel pomelo saving the fruit for a different purpose. 2. Carefully remove all of the white pith from the green peel. The pith is quite bitter so you want to remove as much as you can. Discard the pith. 3. Slice the pomelo rind into 1/4 inch by 3 inch sticks. 4. Bring a medium pot of water to a boil. Place pomelo rind in the pot and blanch for one minute. Discard the water and rinse rind under cool water. Repeat this process three times. This will help to remove a lot of the rinds bitterness. 5. Place two cups of water and two cups of sugar in a medium saucepan. Bring to a boil to dissolve the sugar. 6. Add pomelo rind to the sugar water and simmer for 1 - 1 1/2 hours, until the liquid has been absorbed and the rinds are translucent. 7. Carefully move the rinds to a rack and sprinkle with sugar. Let them dry for about 3 hours, turning them halfway through. 8. Store in a sealed container.